The end of Spielberg's dark period. H.G. 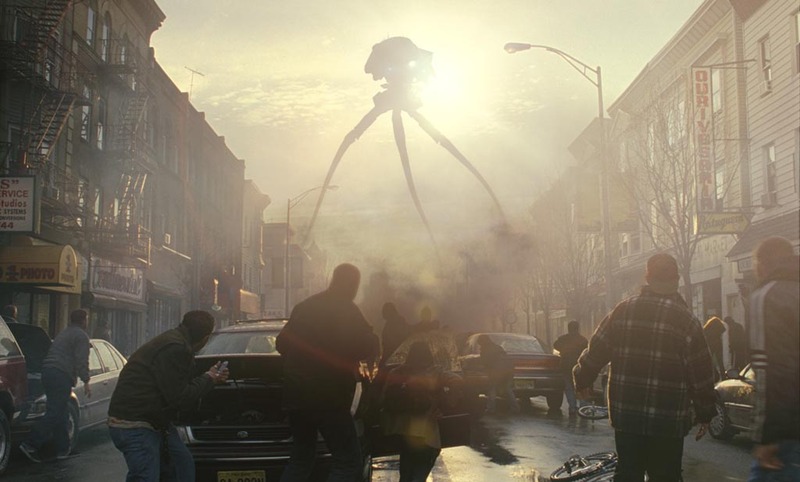 Wells' novel The War of the Worlds was first played out as a prank on the radio by Orson Welles, then visualized as the classic 1953 film, then remade in 2005 by Steven Spielberg. This was the last film in his cold, dark period (A.I., Minority Report, Munich) and second sci-fi outing with Tom Cruise. Unfortunately it was close to this time that Cruise 'lost his way' and his loony-ness overshadowed the success of War of the Worlds. The film itself is a very simple story: a few hours after Ray (Cruise) gets to take care of his kids for the weekend, alien tripods arrive on Earth and begin to destroy humanity. Ray learns to adopt responsibility and earn respect from his kids while fleeing scorched landscapes and hiding from the invaders. But often, Spielberg posits that the aliens aren't the only threat. The scenes with the alien destruction are thrilling but when the family encounter panicked and chaotic humans, the movie takes on a more haunting tone. As humans form mindless mobs out of desperation or if individuals become isolated and insane, there's no telling what they’re capable of. It hits a little closer to home. The movie is thrilling and fast-paced. Simple and dazzling. All of which can all be attributed to the master behind the camera. Sir Steven Spielberg is the main attraction here. I believe this is one of his most creatively shot films. Since the majority of the film is a family running away, he has to keep it interesting at a break-neck speed. He is channeling his younger self who shot Raiders of the Lost Ark. Every scene incorporates a fresh camera movement that pushes, pulls and drags you along. Whether the camera is spinning around a speeding car, running and ducking through a forest, shooting the horror vicariously through mirrors and windows or slinking and hiding in a basement, Spielberg is using his ingenuity to mirror the chaos of the scene with his camera. Then there is the other master behind the lens, the awesome Janusz Kaminski. Ever since Schindler's List, he has been Spielberg's cinematographer, giving each of his films a fantastic gritty look. Here, using the lighting, he illuminates many scenes with flashes of colour in homage to the technicolor original. Sporadic hints of red and deep blue evoke otherworldliness just beyond the frame, just hinting at what you don’t see. His gritty camera grain is mixed well with the cool alien designs, creating some believable scenarios full of despair. Initially, on my first viewing (along with most people), I hated the ending. Nowadays, I am fine with it. The Morgan Freeman summation makes sense, and is in the spirit of the original, yet is barely touched upon throughout this film; making the end feel rushed and cheesy. I don't have an issue with the son returning. That needs to happen thematically. Ray needs to learn to let go of his son, and to know that his boy can survive on his own. It was just unfortunate that the end was shot so pristinely, evoking a cheesy ‘happily ever after’ feel. Like hell on wheels, a ghostly train engulfed in flames careens through a traffic stop in a snowy apocalypse. Barely observed by a desensitized mob on a mass exodus: controlled chaos reigns throughout War of the Worlds. Spielberg’s overlooked sci-fi epic suffers very little from its rushed ending, and triumphs as a masterclass in art direction, sound mixing, visual effects, cinematography and flamboyant bravura filmmaking.